Nanusens, the pioneer of sensors built inside CMOS, has announced that its proprietary technology can significantly increase the operational life of earbuds by up to 20%. This can be achieved by replacing the MEMS sensors in an earbud with a single multi-sensor chip solution that is up to ten times smaller, freeing up space for larger batteries. 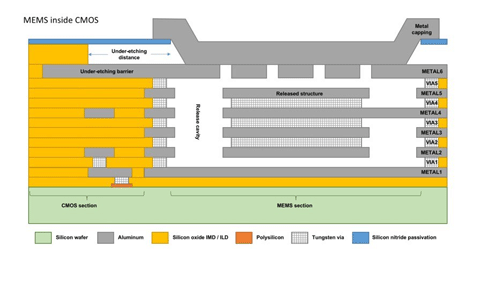 A MEMS (Micro Electro Mechanical Systems) sensor package contains a chip with the MEMS sensor, which is made on the microscopic scale, and a chip with the control electronics resulting in a volume of four cubic millimetres. Nanusens creates its sensors on the nanoscale within the layers of its CMOS chip that also has the control electronics. As a result, the NEMS (Nano Electro Mechanical Systems) chip is only one cubic millimetre so this will create a saving of three cubic millimetres for every MEMS package that it replaces. The more MEMS packages are replaced and their functions done by a multi-sensor Nanusens chip, the greater the space savings. Plus the Nanusens chip only increases slightly with every additional sensor function to accommodate additional control electronics. In addition, far less PCB estate is needed for the tiny, single chip solution compared to the PCB estate required for several MEMS packages. All this freed-up space can be used to increase the size of the battery or add a supercapacitor to extend the battery life to give a better user experience and longer audio on the go™.